With buzz surrounding wearable technology dominating the 2014 CES in Las Vegas, chatter coming from the floor has also been relaying the advent of curved screens. No longer accepting that a touch interface or screens must be flat, convex and concave shapes could be commonplace. The majority of devices showing off curved displays are smartphones and televisions. However, one company at CES is marketing the potential of curved touch controls in future automotive interiors. Microcontroller and touch technology solutions provider Atmel Corporation has brought an array of ideas purposing to change the way driver’s interact with their cars. Exhibited on their AvantCar concept, Atmel’s high-tech interior features reveal several advancements meant to make the interaction with vehicle controls more natural and attractive. While Atmel’s local interconnect networking systems will probably appeal fascinating to automotive engineers, a large touchscreen with an ultra sensitive, high response rate exhibited within the AvantCar’s center console can easily entice the broad audience of gadget-loving motorists. A featured technology drawing the greatest intrigue with Atmel’s AvantCar is the XSense curved touch interface. Employing a surface utilizing metal mesh technology, the XSense touch sensor residing inside an automobile could greatly contribute to sound ergonomics and interior style. Perhaps the first spot coming to mind for the use of Atmel’s XSense technology would be creating curved vehicle infotainment displays operating on MyFord Touch or the systems related to newly-announced Android-based consoles. The major pitch of Atmel’s XSense touch sensor technology actually takes place away from the center-mounted infotainment touchscreen. The solution is created as a replacement of mechanical switches, knobs and buttons found as part of almost every modern vehicle interior. On future vehicles, windows, door locks and climate controls could potentially be operated through touch with XSense. Who knows, maybe the steering wheel could also be replaced with a wheel-like touch sensor on a future car. Atmel champions the longevity and weatherproof of the XSense touch sensor as being beneficial for applications within future vehicle interiors. The wide-scale possibilities of curved touch sensors will also serve as a blessing to the interior stylists for major auto companies as a full-range of shapes can be presented in a cutting-edge fashion. 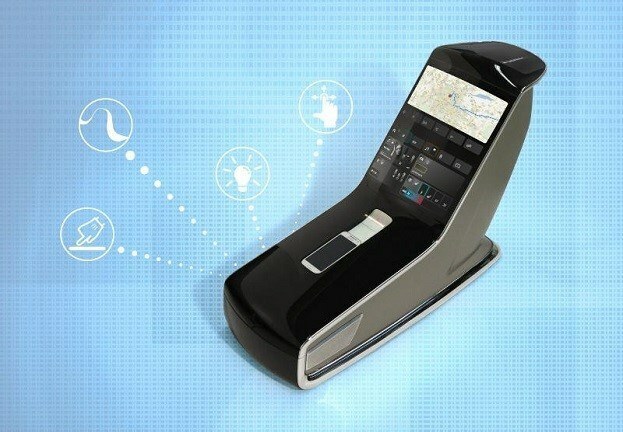 An indication for what the future driver may be handling in the near future, the Atmel’s center console design featuring curved surfaces at 2014 CES provides a concept displaying new creative and operating freedom expressed in a simple touch. 1 Comment on "2014 CES Showcase: Curved Touch Interfaces for Cars"
When it comes to auto manufacturers connecting with the customers, always technology comes first. Today people buy cars based its look and its user-friendly technology.